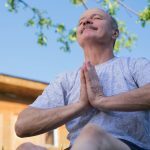 A recent conversation with a colleague made me realize that people are not aware that meditation can be used for pain relief. Meditation is widely seen and heard of these days. We hear about it on tv, social media, YouTube, in our fitness classes and from inspirational speakers. Some people believe it’s a fad while others say, “I can’t quiet my mind”. We can all learn to quiet the mind and we all should as it is critical for your mind and body’s well being. Pain can be a great motivator for you to start meditating as you can achieve pain relief through meditation. So many of us struggle with pain every day but you don’t have to with a daily practice of meditation. I have experienced the benefits of meditation first hand. Regularly practicing myself, I no longer have aches, pains, headaches, and back pain. I haven’t taken a pain reliever for a long time because I don’t need to. You may find it common to hear that those who meditate regularly are generally pain free. It does take time to get to a pain free state. You will need to be patient and meditate consistently. Imagine being pain free. Doesn’t that sound wonderful? When an illness or injury occurs, our bodies nerve endings can become hyperactive. Our muscles, tendons, tissues of the body are damaged, scarred, and tense. We become attached to the body and our brain learns also to attach. Meditation helps us to train the brain to let go of the body, relax the nerve endings, relax the tension, let go of the feeling of pain. I’m not a medical professional and I’m not claiming to know the body’s physiology. I know what I have been taught through Yoga training and my own life wisdom, and what works. To experience pain relief through meditation, you need to learn how to meditate from the inside. This means you can not have any outside distractions. So many people follow a guided meditation or music to meditate and that’s fine especially when you are learning. True meditation is sitting in quietly and going inside yourself. Start by taking a mindfulness approach. Start by focusing and listening to your breath. Try practicing this for 5 minutes everyday for the first week. For the following weeks, try extending your time a little longer each week. Over time it will become a habit and grow in duration. Practice as long as what feels comfortable for you. You will discover that there are so many benefits but a big one for many is pain relief. Imagine living an almost pain free, more relaxed life. Ahhhhhh…. 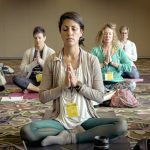 Would you like some FREE meditations to get you started? Stop by my website to get your free meditations today. Alternatively, connect with me to see when I am offering my next workshop on meditations.